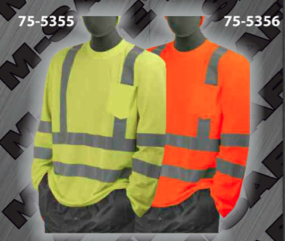 Looking to buy safety t-shirts in Rochester NY, Ithaca NY, and Western NY at competitive prices & with exceptional service? The Duke Company proudly carries the finest Safety T-Shirt – ANSI Class 3 Deluxe Long-Sleeve T-Shirts in High Visibility Yellow and High Visibility Orange. High visibility single waist stripe. Renown birds-eye material is widely respected for wicking away moisture to keep your crew dry and comfortable on the job site. Widely respected 3M reflective material.